A Spalding businesswoman is in the final stages of training for the London Marathon to raise money for a young girl with a mystery illness. Monika Todd will be pounding the streets of the capital for Alethia Greenfield who will be 11 three days after the marathon. The Donington youngster has been left immobile and is now without speech as a result of an as-yet undiagnosed illness which started about a year ago. Monika, a business and personal development coach, has always wanted to run the marathon and is friends with Alethia’s mum Emilia, who has given up her job to care for her daughter. 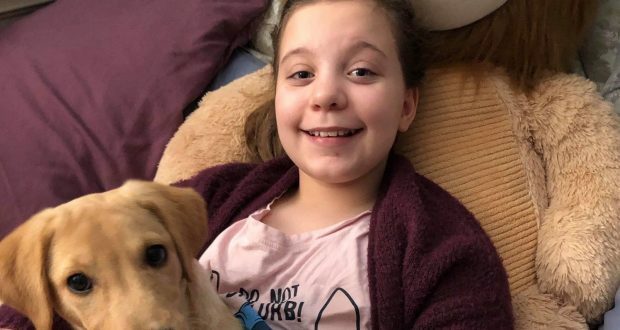 They are desperately trying to raise £5,000 for a special care seat to enable Alethia (pictured) the chance to get out and to be transported to hospital. “I am really looking forward to the marathon and have trained hard. I’m a bit nervous, but more excited,” said Monika. Alethia is still waiting to be seen by specialists at Great Ormond Street Children’s Hospital in London and her mum said this week that her condition had deteriorated. “We are planning a big fundraising day on May 25 as we are still a way off the target,” said Emilia. Cake and coffee are already on the agenda for the event at Donington Village Hall which starts at 10am. Other attractions will be added to the day and Emilia is determined to buy the special seat her daughter needs. A recent trip to the dentist saw Alethia carried to the car and sat next to a family friend who helped hold onto her along with Emilia’s partner Ashley. The family is also learning sign language so that despite Alethia’s failing speech does not result in her isolation. Aside from loss of mobility and speech, Alethia has seizures and cannot tolerate noise or bright light. She has had to stop attending school and her illness is also affecting her older brother and sister who attend the Thomas Cowley School. With no diagnosis, there has been no help with finances for the family. Alethia was a normal, active and energetic girl until she started getting pains in her legs a year ago. The situation has escalated to the point where she needs 24-hour care. Initially she was diagnosed with Achilles tendon problems and had both legs put in a cast. Her family was also told she had Functional Neurological Disorder.